Taking advantage of the unusually sunny weather I got up early Monday morning and went to the river to catch some beautiful fog. 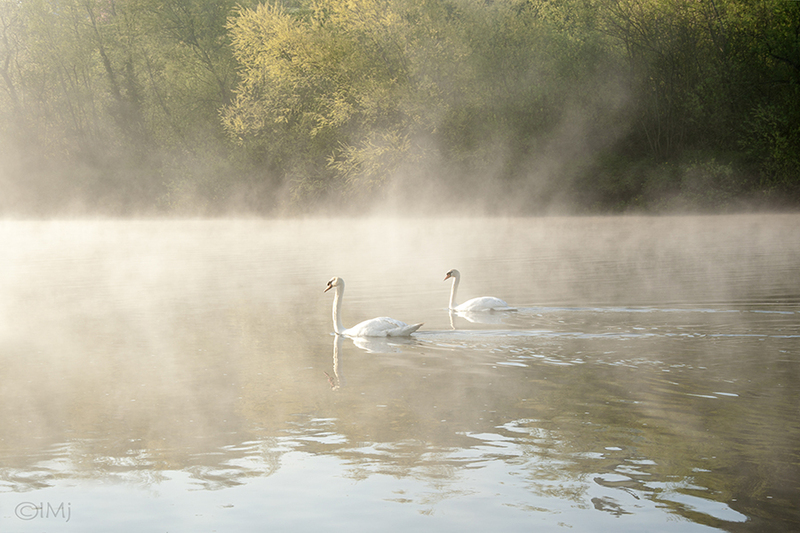 A pair of swans floated by as i walked towards the river bend to get a nicer view. I set up a composition, ready to press the shutter button. 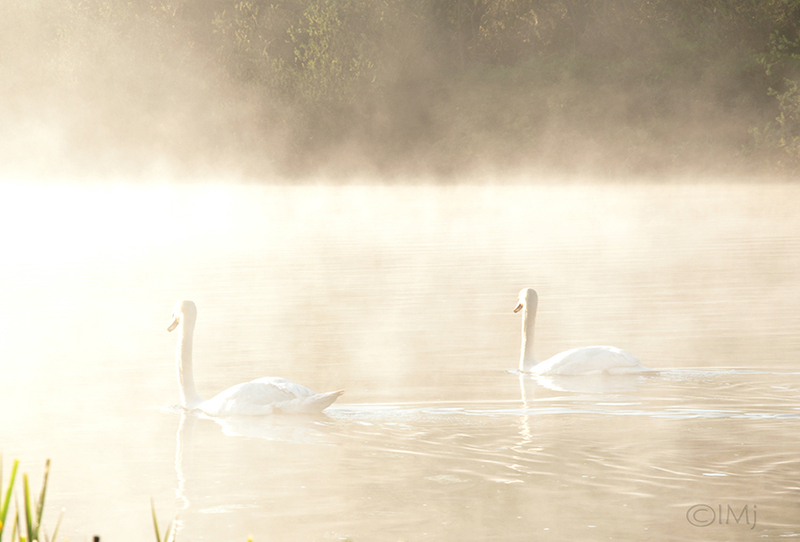 I completely forgot about the swans, but suddenly they just floated into my frame! Making it through the fog they looked so mysterious, almost ghostly. I got a few shots of them, and when they were gone I just knew it was the time to go back home because I wouldn’t get anything better today. I was thinking about the days when I was very young. My Dad and I would go to the woods, and he would show and explain me everything he knew about the wild life and survival. And he knew a lot. My Dad spent many weeks hiding in the woods and running for his life during the World War II. I remember mushroom and berry picking with him. Being very young I didn’t understand the limits of things, and I wanted more and more of those mushrooms because it was fun to find them. My Dad taught me to never be greedy. He taught me to know where to stop. If I need many, fair enough, but I have to decide how many, exactly, and stop when I am done. And this applies to everything. I cannot tell that I have been following his teachings all my life; definitely not. But still, it is nice to know that your Dad was right, and that he, actually, did exactly what he taught. Photography tip of the day: Ask yourself these questions: What is my subject? How can I give emphasis to my subject? How can I simplify my photograph? Thank you for stopping by! 🙂 Have a great weekend! btw…is your loc Ireland or States ? When light, subject, and you with camera come together it is skill. When it happens unexpectedly it’s serendipity, and I love it. Thank you for commenting! Glad you like the picture. To catch serendipity one has to be in the right place in the right time:) Have a good day! I’ll stop and look at anything with the word fog attached to it – but this is truly exceptional. Exquisite. Thank you so much for visiting and commenting! Foggy morning is my favorite time for photography:) I live on the river bank and catch the fog quite often. Thank you again for your kind comment! Do you have a first name I might call you? I believe I’ll be commenting a long time, your work enchants me and I love having a name when I address someone. Somehow it seems to make everything more personnel. When I happened upon your blog this evening it was perfect timing. I happened to have a film graduate student in my office and I was able to show her my favorite style of photo blog (your style wherein the artist uses both their camera work with the written word). Thank you for your kindness Sheri, my first name is Inese as in inesemjphotography. English is my third language, so my writings sure suffer from clumsiness:) It is why I write little and rather rely on the universal language of photography. Inese – I thought I probably had a good guess of your first name but I wasn’t about to take it for granted. I can hardly wait to get back to your site to have a leisurely walk through your sites. I love to visit photo sites and stroll through as if on a visit to wherever the photographer is. I would never have thought English was your 3rd language – you are indeed gifted. Thank you Sheri! This is not a gift, just an effort:) Have a good Sunday! Really nice capture! 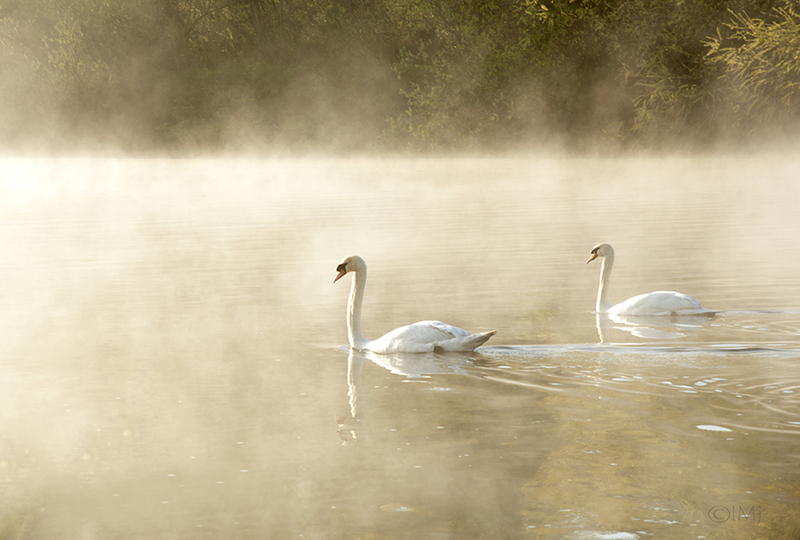 I have been photographing the morning mist but have not been so lucky to have two swans float by! Thank you so much for stopping by! You know, like anybody else i have taken lots of swan pictures, but never before the light + the swans came together so nicely:) Thank you again!